Someone To Watch Over Me! Making the decision to surrender your ferret/s is a difficult and sometimes heart-wrenching experience. This admission process explanation should help you understand the steps and smooth the adjustment period for your pets. Why do you need to give up your ferret? Sometimes there are problems we can help solve! There are some tips under our Surrenders page. If you are experiencing Behavior problems we can try to help resolve those as well. Our goal is to try to help. How old is your ferret? Older ferrets, especially who’ve never been around others, get very stressed in a shelter. A 5 to 6-year-old ferret is elderly. It is very hard to find a home for an older or ill animal. Maybe you can continue to care for your oldie another year or two? How soon do you need to give up your ferret? The FACT shelter is small and we need to manage admissions. Certain times of the year, like summer, many more people look to surrender pets than adopt. We can usually find homes faster in the winter and spring. Have you tried to find homes on your own? You might find a new home in your circle of friends/relatives. While Craigslist is an option, first try through Facebook or notices posted at vet offices and pet stores. Adopt-a-Pet.com allows private owners to post animals and gets good quality responses. We’re happy to share tips on what to look for in a new caretaker. We also offer an Assisted Adoption program which works for people committed to staying involved in the Adoption Process. Have you contacted your local large humane society? A great many now accept and adopt out ferrets. They have paid staff, buildings, and open hours that means many more people will see your pets. If your ferret bites or has special needs, however, a dedicated ferret shelter might be the better option. 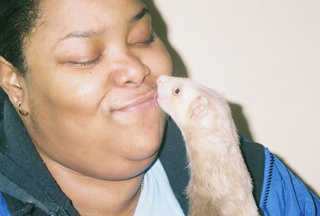 How FACT finds homes for ferrets: The Adoption Process helps ensure ferrets surrendered to FACT find permanent homes. Contact Us to make an appointment to Surrender your ferret/s: THE FACT SHELTER WORKS BY APPOINTMENT ONLY. Please do not do NOT stop in. No one may be there as we are a home-based shelter and do NOT maintain regular hours. NEVER LEAVE AN ANIMAL ON A DOORSTEP as that is considered abandonment. Please leave a phone message or Contact Us via email. We return all emails within 24 to 48 hours. If you have not heard from us, try once again. Email is NOT 100% perfect. Our response rate is 99.9%. Once you’ve made an appointment: If you’ve found a home, changed your mind, or have to cancel or change your appointment, PLEASE call and let us know! We’re waiting for you. Some of the food your ferret is currently eating. The ferret’s medical records and/or the name & phone of your vet, if any. Any vaccination records you have are important to bring. Purchase receipt or paperwork, if you have it. Please don’t bring other ferret items unless we’ve discussed and OK’d it in advance. We don’t use cages or litter pans and have plenty of toys, bedding, shampoo, etc. We’ll ask about your ferret’s age, food, and vaccination history. We also need to know where and how you obtained your pet and how long you have owned him/her. If he/she bites or has other quirks, please let us know. This all goes on a form that will stay with your pet. You’ll sign a standard surrender form that states you are the legal owner of the animal and are transferring ownership to the shelter. The form also asks for the surrender reason to help us better understand the challenges we and the new owners face caring for their ferrets. You will get a copy of this form. Understand you are permanently surrendering your pet. If your situation changes and you can again care for ferrets, you must go through our adoption process just like any other adopter. We do not “hold” animals for people who may wish to reclaim them. Donations to help pay for your ferret’s care while they await adoption are appreciated. We do not have a “standard” surrender fee like many humane societies. However, we are totally dependent upon contributions to operate. Adoption fees only partially help pay for the vaccines, health check, microchip and other healthcare each ferret may need. Fees charged to not cover the cost of housing animals. Since we do not put animals down unless medically necessary, your ferret may wait several months for an appropriate home. You are welcome to see the shelter room where your ferret will be living and briefly watch them meet the other ferrets. Due to liability issues, unfortunately, we can’t let everyone inside the room. We also ask you keep small children from reaching out for any ferret that may come to the door because we sometimes we have animals that bite. If you want to connect with the new owner, please check back with us periodically to see if your ferret has been adopted. If the new owner agrees, we’re happy to pass on contact information. Thank you for being responsible and bringing your ferret someplace they will be well cared for and rehomed. Our surrender process helps us work to effectively find the best home for each ferret that arrives in our care. I Lost - Found A Ferret! FACT is approved by the Internal Revenue Service as a 501 (C) (3) tax-exempt organization and all donations are tax deductible to the extent provided by law. FACT's Federal Identification Number (EIN) is 061386567. Platinum is Guidestar's highest recognition level for publicly disclosing financial and program results. FACT is participant of the Combined Federal Campaign which allows us to accept payroll deductions from federal government and postal employees. Please use our CFC Code of 40910 to ensure your donations reach us.